SharePoint is now a mission critical application for your organization. 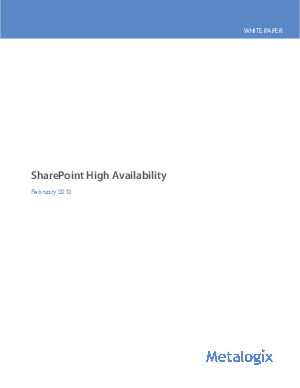 With users around the world collaborating on the same documents, your organization can only function at its highest level if SharePoint content is always available. But what happens in the case of a planned or unplanned disruption? How will you prepare for power, hardware, network or software failures or a planned outage that cause downtime and haunt your nightmares? Overcome these challenges by constantly synchronizing your SharePoint content between locations or even over poor networks. Metalogix Replicator is the top SharePoint synchronization product on the market and provides you a complete SharePoint high availability solution.